During this walk you will be introduced by experienced tour guides of Mystical Earth Tours to the magic and mystery of the Isle of Avalon; why is this place so special and what does it offer you when you come here. People have been attracted for centuries to come to Glastonbury and experience the wonderful Avalon energy that is unique in the world. On this walk you will get a taster of what Glastonbury offers to the spiritual pilgrim. You will hear about the many spiritual paths, ‘new-age’ shops, healers, the Goddess community and sacred sites like the famous Tor and the Red and White Spring. A visit to Glastonbury can be overwhelming for some, but this walk will help you to get grounded and to get inspired of what to do and where to start your personal journey. The walk will take you through the High Street passed all the special shops and places. Then on to Benedict street for a wonderful view of the Tor and to hear about the legends about the sacred Isle of Avalon. You will be shown the outside of the Goddess Hall with the beautiful mural depicting the Arrival on Avalon. The walk will finish at the Goddess House for a show around and a short meditation. Mystical Earth Tours are Alastair, Joanne, Marion, Manon and Marisa, five experienced tour guides with a passion for the Land. We offer Tours and Walks, Transformational Teachings and Sacred Ceremonies. We provide a unique opportunity to experience the magic of the Land, told through myth, legend, history and her-story. 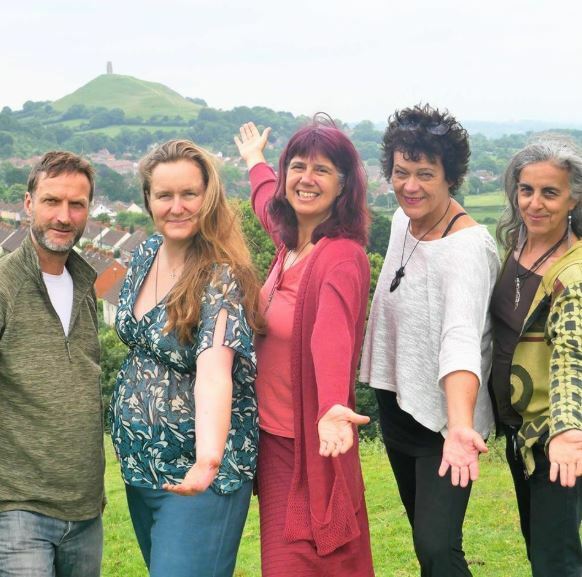 We aim to offer you a personal experience of Glastonbury-Avalon and sacred sites of the South-West and the British Isles, through the sharing of knowledge and ceremonial work. By doing this we hope you will connect, not just with the land, but also with yourself, in a different way, on a deeper level.